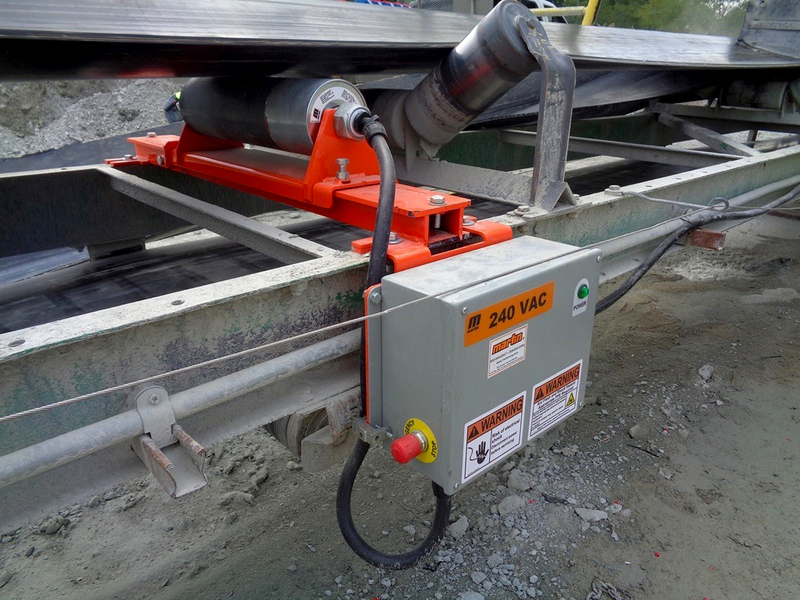 Neponset (IL), United States – An innovative cement manufacturer in the Midwestern U.S. has implemented a unique power solution developed by Martin Engineering at a remote conveyor location that lacked convenient electrical access. 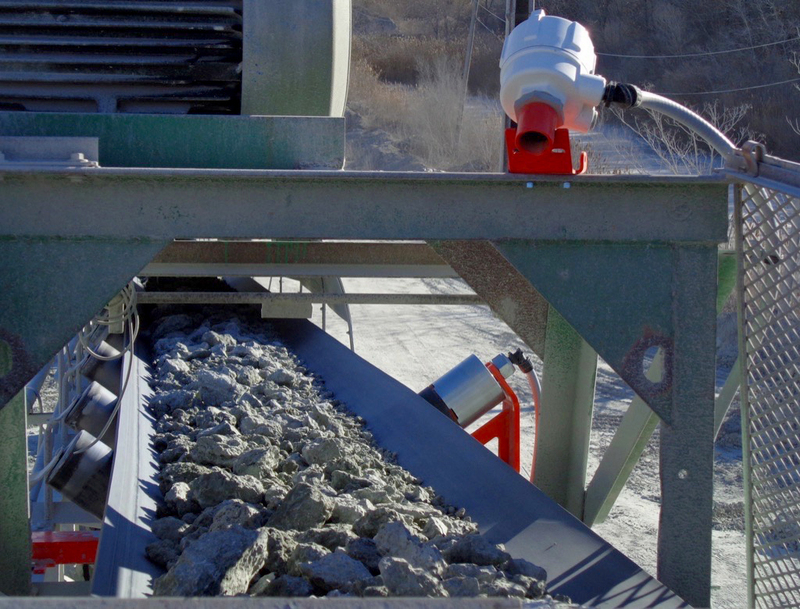 The patent-pending design uses the kinetic energy of the moving belt to generate enough electricity to drive an automated dust suppression system, a pneumatic belt cleaner tensioner and a series of air cannons, helping operators at the Illinois Cement Plant reduce fugitive dust and spillage, increase cargo flow efficiency and minimize labor costs for cleaning and maintenance. The Roll Gen System uses the movement of the belt to produce localized power. The Martin® Roll Gen™ System is designed to create a self-contained mini power station that allows operators to run electrical monitoring systems, safety devices and a variety of other components. Able to be retrofitted on existing idler support structures, the generator can be employed on virtually any steel roller. The device is considered a significant step toward eliminating power production obstacles, as conveyors move into the next generation of “smart systems” that are predicted to be more sustainable and autonomous. The 107-1 conveyor rises 20 feet (6 m) at its mid-section. 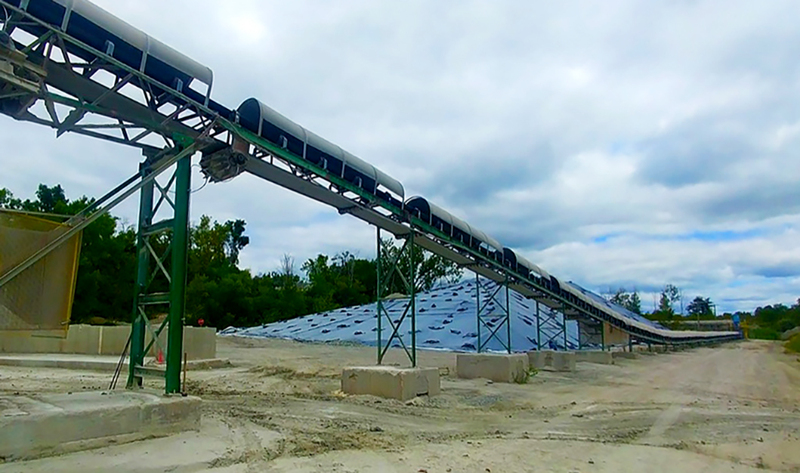 Conveyor #107-1 is the longest outdoor conveyor system on the Illinois Cement site, running 600 feet (182 m) and discharging either onto the #107-2 stack-out conveyor or the 250-foot-long (75 m) belt leading directly into the plant, based upon immediate production needs. It’s a 30-inch wide (762 mm) mechanically-spliced belt with a 35º trough that travels at ~400 fpm (2 m/s), conveying nearly 300 st/h (272 mt/h) of limestone. Material arriving from the quarry can be either wet, dry and dusty or anything in between, depending on the season and weather. The changing work environment presented challenges throughout the entire conveying system, with different weather conditions triggering various types of carryback. Cleanup was labor-intensive. Phase one of the Martin Engineering solution involved placing a “smart” dust suppression system at the transfer point between the 153 and 107-1 conveyors. Phase two included an automated, pneumatically-tensioned belt cleaner and air cannon system at 107-1’s discharge zone. Both components are powered by the Roll Gen System. To control fugitive emissions, the Martin® Surfactant Dust System treats the cargo at the transfer point. To manage the dust, technicians installed a Martin® Surfactant Dust System at the transfer point between 153 and 170-1 to deliver a chemically-enhanced water spray as a topical treatment for material at the point of emission. Triggered by a sensor as soon as the load enters the transfer point, the system supports dust mitigation measures already in place to minimize the labor needed for maintenance and replacement of the dust collector cartridges. Close to the mid-point of the system, conveyor 107-1 begins a gradual 20-foot (6 m) rise and discharges into the transfer chute leading either to the stack-out conveyor feeding the storage area or the main conveyor entering the plant. At that transfer point, technicians installed a Martin® QC1™ Primary Cleaner XHD (extra heavy duty) tensioned with an Automated Blade System (ABS). 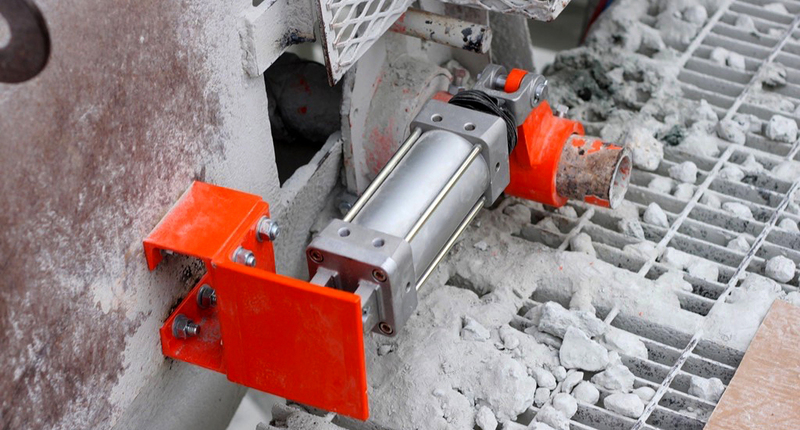 The Automated Blade System eliminates the need for manual blade tensioning. Connected to a small 24V DC air compressor and a control panel powered by the Roll Gen, the ABS pneumatic tensioner delivers precise monitoring and tensioning to reduce the labor typically required to maintain optimum blade pressure through manual adjustment. Equipped with sensors to confirm when the belt is running empty, the system automatically backs the blade away, minimizing unnecessary wear to both the belt and cleaner. Powered by the Roll Gen, a sensor detects material on the belt and communicates with control systems. The 70-L Hurricane Air Cannon features a fan jet nozzle for wide coverage. 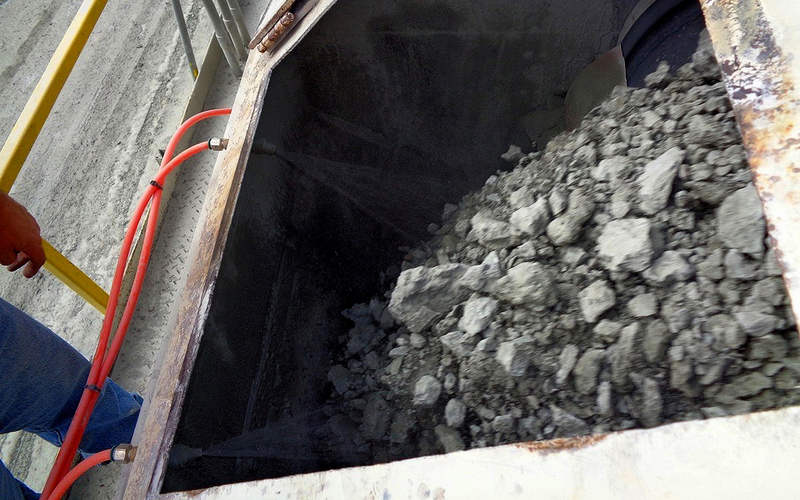 While monitoring the results of the installation, Martin Engineering technicians observed that the decreased spillage resulted in a proportional increase in fines discharged down the transfer chute. Exposed to the outside environment, the chute began to form significant buildup along the sides, at the diverter gate and on the internal shelf meant to slow the flow of material. The technicians had a solution to this unexpected result, and to mitigate the buildup, they installed a Martin® Hurricane Air Cannon. The use of multiple technologies working in tandem to control material flow and prevent fugitive particles has dramatically improved the material handling system’s efficiency. 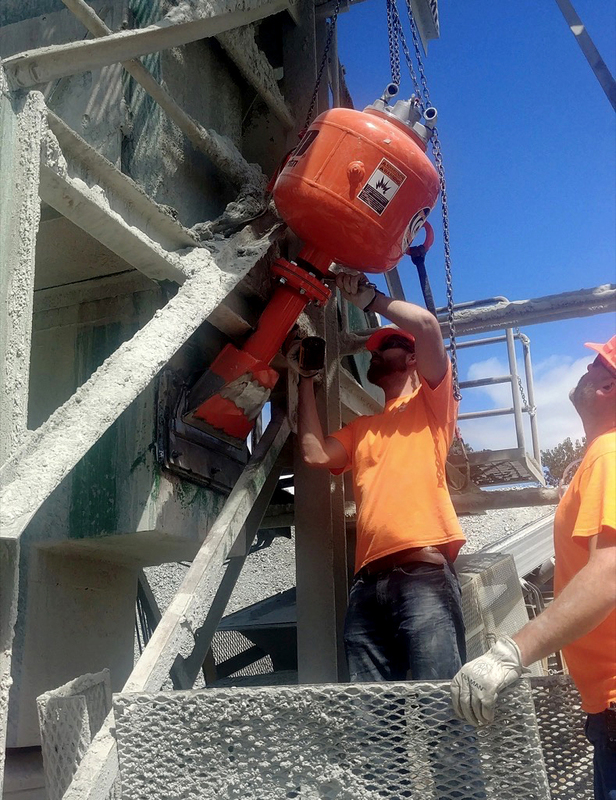 The modifications have helped Illinois Cement reduce labor and equipment expenses, considerably cutting the manpower needed to clean spillage along the conveyor path. The result is a cleaner, safer and more productive operation. “The entire project has been a success, particularly in how many man-hours we save in maintenance and upkeep,” Brandner concluded. “The tensioning system does a great job, and the Roll Gen puts out enough power that we’re considering adding an automated secondary cleaner and a vibrating dribble chute to capture even more carryback.